There are over 20,000 species of spiders in the world. Most of these spiders cause harmless bites in humans. In the United States, there are two species that cause serious bites in humans. 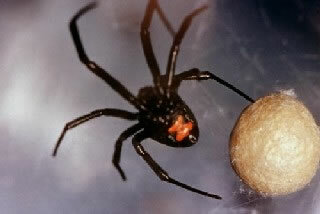 These are the black widow (Lactrodectus) and the brown recluse (Loxosceles). If you see your doctor, bring the spider along in a jar for identification. Brown recluse spiders are very hard to identify. Sometimes people wrongly believe that they have had a spider bite. Instead, they may have a skin infection with bacteria called Staphylococcus aureus (MRSA). Description: a shiny, jet-black spider with long legs. The total size of the spider is 1 inch (25 mm). It may have a red or orange hourglass-shaped marking on its underside. This will not be on all spiders of this species. Habitat: found throughout North America. They are not found in Alaska or the far North. Symptoms - Bite Wound: the bite causes moderate to severe pain right away. There is most often little to no reaction at the bite. Symptoms - Systemic: severe muscle cramps within 1- 6 hours. These will last 24-48 hours. Other symptoms include stomach pain, vomiting, restlessness, hypertension, and weakness. Treatment - Wound Care: wash bite with soap and water. Put an ice pack on the bite. Treatment - Medications: tetanus prophylaxis should be provided. Parenteral analgesics may be needed for pain and benzodiazepines for muscle spasms. There is a Lactrodectus anti-venom that is used for severe symptoms, seizures, or very high blood pressure. What to Expect: symptoms most often go away in 2-3 days. These bites rarely cause death. A bite is more serious in a small child, as are multiple bites. Special Note: many bite wounds are "dry bites." This means that no poison was injected into skin. Also known as the "violin" or "fiddleback" spider. Description: a brown spider with long legs. 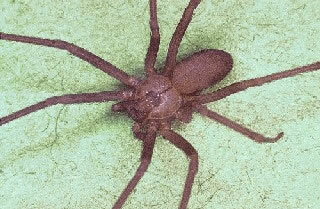 The total size of the spider is ½ inch (12 mm). It has a dark violin-shaped marking on top of its head. This will not be on all spiders of this species. Habitat: found in the Southern, Southwestern and Midwestern United States. Symptoms - Bite Wound: the spider's poison causes cell destruction and blood cell breakdown. The bite is first painless or minimally painful. There will be pain and blisters at the bite within 4-8 hours. The middle becomes bluish and crater-like over 2-3 days. The skin inside the crater may die. This is called a necrotic ulcer. Symptoms - Systemic: these include fever, vomiting, and muscle aches. There are no life-threatening symptoms. Treatment - Wound Care: wash bite with soap and water. Put a cold pack on the bite. Treatment - Medications: tetanus prophylaxis should be provided. What to Expect: most necrotic ulcers heal over 1-8 weeks. Scarring happens to 10-15% of bites. Skin damage sometimes needs skin grafting. Also known as the funnel-web spiders. Description: a brown spider with long legs. Size is about ½ to ¾ inch (12-20 mm). Appearance varies, it is often hard to identify. Habitat: found in Canada and the United States. Symptoms - Bite Wound: generally considered harmless, despite their somewhat larger size. A bite may be painful and mildly swollen for 1 or 2 days (much like a bee sting). Treatment - Medications: get a tetanus booster if it has been longer than 10 years since your last one. What to Expect: bite wounds heal completely. Habitat: tarantulas are found in the Southern United States (like the Desert Southwest). Symptoms - Bite Wound: mild stinging with a little swelling at the bite. The bite does not cause skin tissue to die. Symptoms - Eye: some tarantulas have hairs that can come off. Like a fiberglass fragment, they can penetrate skin and cause itching and redness. If they lodge in the eye, they can cause eye problems. Treatment - Wound Care: clean the bite wound with soap and water. Put a cold pack on it and take pain medicine. Get a tetanus booster if it has been more than 10 years since last shot. Treatment - Eye Irritation: see an eye doctor if you have irritation or redness after handling a tarantula. The doctor will perform a slit lamp exam of the eye. What to Expect: bite wounds fully heal. Eye problems often go away under the care of an eye doctor. More than 50 spiders in the United States and Canada have poison. They can cause minor, non-serious reactions. Single, unexplained painful bites that happen during the night can be from spiders. Symptoms - Bite Wound: the bites are painful and mildly swollen for 1-2 days. They may look like a bee sting. Treatment - Wound Care: clean the bite wound with soap and water. Put a cold pack on the bite and take pain medicine. Get a tetanus booster if it has been more than 10 years since last shot. What to Expect: bite wounds fully heal. You can treat non-serious spider bites at home. Cleansing: Wash the bite with soap and water. What to Expect: You will have some swelling and pain for 1-2 days. It should not be any worse than a bee sting. Be careful near wood piles and when clearing brush. Wear long pants with the pants tucked into your socks. Wear long-sleeved shirts and use gloves. DEET is a very strong insect repellent. It also repels spiders. Make certain that doorways and windows are sealed and insulated. Higher strength DEET works better. All DEET over 50% works the same. For children and teens, the American Academy of Pediatrics recommends a maximum strength of 30%. Health Canada recommends using a strength of 5-30% for adults. Spray on exposed areas of skin. Do not put near your eyes, mouth or any irritated skin. Do not put it on skin that is covered by clothing. Always wash it off with soap and water when you return indoors. DEET can damage clothing made of synthetic fibers, plastics, and leather. Women who are breastfeeding may use DEET. No problems have been found.